In 1959, two members of the Dartmouth Medical School faculty set out in a small plane on a medical mission to northern New Hampshire. They never returned. Four decades later, the impact of their death in the North Country's unforgiving forests still resonates through Dartmouth and the region's wilderness rescue community. 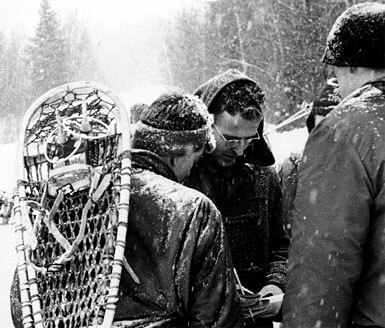 Microbiologist Philip Nice, facing the camera, was one of numerous Dartmouth College and Dartmouth Medical School faculty members and students who took to the woods in the wake of a 1959 plane crash in an effort to find the downed plane's pilot and passenger both of whom were members of the DMS faculty. As freezing rain and dense fog enveloped the Upper Connecticut River Valley on the morning of December 24, 1996, a Learjet flown by two Connecticut-based pilots requested clearance to land at the Lebanon, N.H., Airport. Partway into their instrument approach through the storm, the pilots aborted the landing and regained altitude for a second try. Moments later, the Learjet disappeared from the control tower's radar screens. The ensuing air and ground search involved hundreds of volunteers, including several Dartmouth medical student members of the Upper Valley Wilderness Response Team. More than a dozen Army helicopters were committed to the effort. Scuba divers scoured the depths of several lakes. Debate raged over how far the plane might have traveled before it crashed. When all reasonable hope of the pilots' survival was gone, and additional snow accumulation made it unlikely that the sleek jet would be discovered before the spring thaw, the official search was suspended. Still, scattered groups of volunteers and members of the pilots' families continued to search the region's heavily wooded hillsides for many months afterward. One reason so many Upper Valley residents refused to abandon the search for the two young pilots from Connecticut was the still-vivid memory of an equally puzzling airplane crash in 1959. That crash devastated the then-small Dartmouth Medical School community, for its pilot and passenger were both members of the DMS faculty. Ralph Miller, M.D., was chair of pathology, director of the laboratories at Mary Hitchcock Memorial Hospital, and a senior consultant in pathology for the Veterans Administration Hospital in White River Junction, Vt. A graduate of both Dartmouth College and the Medical School, he'd been on the faculty at DMS since 1931, after completing his M.D. at Harvard, a year of internship at Mary Hitchcock, and a fellowship in pathology at the Mayo Foundation. In 1959, at 60 years of age, he was at the peak of his career. When he wasn't teaching medical students or performing autopsies, Miller was doing something in the outdoors. He maintained a lifelong connection with the Dartmouth Outing Club, which he had joined when he was an undergraduate. His love of Alpine skiing had inspired his son, Ralph, Jr., also a Dartmouth College graduate, to establish the world speed record on skis in 1955 and to earn a spot on the 1956 Olympic ski team. Both father and son were known for their love of the rugged outdoors and for going fast. But perhaps Dr. Miller's greatest joy was flying. He was an accomplished pilot with more than 20 years of experience in several types of private aircraft. He had flown two Arctic research expeditions for Dartmouth and was a charter member of the Lebanon chapter of the Civil Air Patrol. And it was not uncommon for him to combine his passion for flying with his medical work. He frequently traveled in his own plane to medical conferences all over the country and, in the course of doing autopsies around the state, had flown into many a small airstrip in remote New Hampshire towns. Ralph Miller's greatest joy was probably flying. He is pictured at right ready to go aloft and above, in August of 1955, with Dartmouth anthropologist Elmer Harp; they had just returned from a two-month expedition to the Northwest Territories, and Harp recalls that Miller had taught him to fly before they left, so there would be a second pilot in the plane. When Miller crashed in 1959, numerous aircraftboth private and military (below)joined in the search for his downed plane. On the morning of Saturday, February 21, 1959, Miller agreed to fly his colleague Robert Quinn, M.D., to Berlin, N.H., north of the White Mountains. Quinn had been asked to consult on a patient there with serious heart problems, while Miller himself was already planning to fly north to do an autopsy in Lancaster, N.H., only 20 miles from Berlin. Quinn, 32 years old, was a respected young cardiologist who had been recruited to Dartmouth in 1956. After earning his M.D. from Yale, Quinn had served two years in the Army Medical Corps and done research at Harvard before joining the faculty at Dartmouth and the medical staff at both the Hitchcock Clinic and the White River Junction VA Hospital. The weather was not good when Miller's cream and red Piper Comanche left Lebanon Airport, but the weather in northern New England is seldom ideal for flyingand Quinn was urgently needed at the Berlin Hospital. Miller had filed a six-hour round-trip flight plan that on the way back would bring them over Gorham and Littleton, then down the Connecticut River to Lebanon. 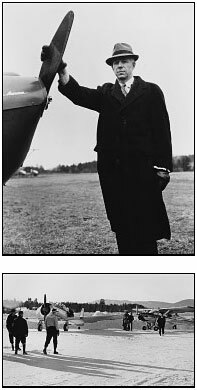 On the outbound leg, Miller planned to drop Quinn off in Berlin to see his cardiac patient, then make a short hop to an airstrip in Whitefield, N.H.; from there, he would travel to nearby Lancaster to perform the autopsy before flying back to Berlin to pick up his colleague for the trip home. All went according to schedule until Miller returned to Berlin from Whitefield in mid-afternoon. The weather was deteriorating, and shortly before 3:00 p.m., Dr. Miller canceled his original flight plan. The two doctors then went into nearby Milan for a quick lunch, probably hoping the weather would improve. Sometime around 3:30, the cream and red Comanche was seen taking off from the Berlin airport, even though there were serious snow squalls in the vicinity. Miller hadn't submitted a revised flight plan yet, but the airport official who saw him depart assumed he'd file one by radio. Although he had 20 years' experience as a pilot, Miller had had only eight hours of instrument training, so he generally flew low enough to follow the highways. His plane was identified over Route 2 in Jefferson at 3:35 p.m. At roughly the same time, an Army pilot flying high overhead in the clouds heard Miller twice try to radio the Whitefield Airport. According to the Army pilot, there was no response from Whitefield. No further sightings or reports were ever confirmed. At 9:00 p.m. that same night, Modestino Criscitiello, M.D.a close friend of the Quinns and, like the young cardiologist, a 1956 addition to the Clinic staff and the DMS facultyinformed the Civil Aeronautics Authority that the two physicians had not returned as expected. Despite subzero temperatures and continued snow squalls, a search was launched before dawn on Sunday morning. It quickly became one of the most extensive searches in the state's history, covering hundreds of square miles from Vermont in the west, to Maine in the east, and as far south as Keene, N.H. Although the air search was hampered by several days of bad weather, it eventually involved the Civil Air Patrol, the National Guard, the Army, and the Air Force, as well as dozens of private planes. February 25four days after the doctors' disappearancebrought the first really good weather for aerial surveillance; that day, 70 aircraft crisscrossed northern New Hampshire. More than 260 suspected sightings had been reported and were investigated, but none turned up the missing Comanche. The intensive air search, which included both fixed-wing planes and helicopters, continued for several more days. Before the Air Force withdrew from the effort in early March, its pilots alone had contributed nearly 450 sorties, 700 hours of flying time, and 5,000 gallons of fuel. Miller (above) had been a member of the DMS faculty since 1931, while Quinn (below) had come to Hanover only three years before the 1959 crash. Meanwhile, a massive ground search was also under way, covering some of the wildest terrain in the Northeast. Soldiers from the National Guard, state police officers, and conservation officers from the Department of Fish and Game were joined by numerous faculty members and students from both the Medical School and the College, including many members of the Dartmouth Outing Club. The Dartmouth-based searchers were inspired by the tireless efforts of Philip Nice, M.D., a pathology department colleague of Miller's, and by Ralph Miller, Jr., the pilot's son, who at the time of the accident was a second-year medical student at Dartmouth. But in spite of heroic efforts by hundreds of volunteers, who endured extended exposure to severe winter conditions, hope that the doctors would be found alive began to fade as the days passed. "Even if [the doctors] escaped death when their plane went down," reported the local Valley News on February 26, "it is doubtful if they could resist five nights with temperatures as low as 30 degrees below zero." On March 1, eight days after the plane's disappearance, the official search was halted. Added to the dwindling hope of a successful rescue was fear of possible casualties among the ground searchers, since even daytime temperatures were below zero. Still, sporadic search efforts continued, including occasional air sorties financed by the Medical School and Mary Hitchcock Hospital. March and April passed, without any sign of the missing plane. "Searchers puzzled," said one newspaper headline, while the accompanying story read, "The grim question is 'How can the wreckage of an airplane remain undiscovered with so many planes and searchers probing the area?'" Finally, on Tuesday, May 5, more than two months after the accident, a private plane chartered by Dartmouth, piloted by Richard Stone, and carrying as observer a New Hampshire conservation officer named Richard Melendywas searching the Pemigewasset Wilderness, located east of the impressive Franconia Ridge. The "Pemi," as it is known to hiking and camping enthusiasts, is the large, uninhabited interior of the White Mountain National Forest. Logging operations there in the 1800s had left a network of overgrown skid roads and an abandoned railroad bed once used to extract millions of board-feet of timber. It was not uncommon for Miller to combine his passion for flying with his medical work. 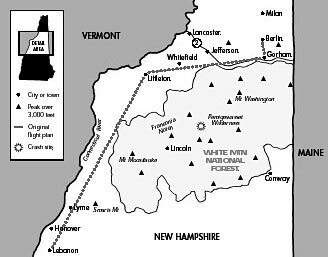 Today, the southern boundary of the Pemigewasset is marked by the popular Kancamagus Highway, which bisects the White Mountain National Forest from Lincoln to Conway. But in 1959, the Kancamagus was still on the drawing boards, and the heart of the Pemi was about as far from a paved road as one could get in New Hampshire. At about 4:00 p.m. on May 5, Officer Melendy spotted the wreckage of a small plane across the Thoreau Falls Trail, at nearly the geographical center of the Pemi. Stone flew back to his base and reported the sighting to John Rand, executive director of the Dartmouth Outing Club. By 4:00 a.m. the next morning, a search party had been mobilized. 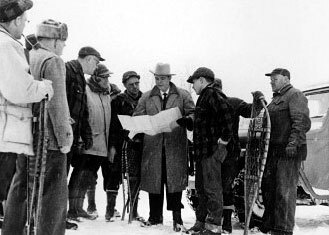 It was led by Miller's colleague Phil Nice and included his son, Ralph, Jr.; Stone; Melendy; and two other conservation officers familiar with the White Mountains. They found the trek slow going, through patches of deep, soft snow and streams that were brimming with spring runoff. A mile from the crash site, one member of the search party discovered an unusual knife in the snow. Ralph Miller, Jr., identified the instrument as a surgical scalpel identical to those used by his father. It was the first indication the searchers had that the doctors had survived the crash. Farther on, the wreckage was sighted. The plane was upside down, partially supported by birch saplings, its crumpled left wing overhanging the trail. Dr. Miller's body was found under the wing. He was wearing a winter jacket and boots. About 200 feet from the aircraft lay Quinn's body. He wore only street clothes and was missing his shoes, which were never found. Miller's jaw had been badly broken in the crash, but Quinn appeared to be uninjured. Near the bodies, hanging from birch saplings, were two sets of crude snowshoes; they had been cannily crafted from branches and surgical tape, with bindings made of Ace bandages and adhesive plaster. Under the left wing of the airplane, near Dr. Miller's body, was a neat pile of firewood that had been cut with a surgical saw. Nearby were the remnants of a signal fire that, sadly, had never been seen from the air. One reason the crash site eluded discovery so long is that it was located well off the original flight plan Miller had filed for the return trip (above). It wasn't until May that the plane was found (right), in the heart of the White Mountain National Forest. Below, Ralph Miller, Jr., is pictured holding his father's final message, which was written in crayon on the fabric of the plane's seat. "When carb ice set us down here Saturday about 4:30 we made camp. Fair night. -5* F. Good wood cut with hacksaw. "Sunday noon we went south on snowshoes (home made) but the road petered out and we returned with enough energy to secure wood for the night. Again fairly comfortable. "It is +5 this morning but reached -10 last night. "It is cloudy and I see little prospect of any planes reaching us today. "We will go north with the chance this abandoned rail road leads somewhere. My charts do not give enough details to be sure where we are. Should we not return, regrets to all. We will keep trying to our limit. "The ice formed so fast on the carb heat control it would not come on. This because I was throttled down so the engine heat was not up to standard 200*. "It was the first time I have had any icing with N5324P." "Monday 10 AMsnowingdecided against any snoeshoing [sic]. All energy used for wood cutting I have little hopegood bye Bettyit has all been wonderfulNo regrets except for Bob. Have fun." "Up until today we were hopeful of being found, but no signs of rescue ship. "Tried to walk out yesterday. No luck. I have become particularly weak. Fighting the cold is hard." "My last and most important message!! Survival instinct fights pain. R.E.M. Goodbye all. This is saving a lot of experiments I hope." For Ralph Miller, Jr., today a physician in Lexington, Ky., the 41 years since his father's death have not dulled the tragic ironies of the accident. The night before the ill-fated flight, father and son had had a spirited conversation about the weather. Dr. Miller felt the most severe storms of the winter were over, while his son argued confidently that more storms and significant snowfalls were still on the way. They bet a bottle of wine on their predictions. The next day, shortly before Miller and Quinn made their final departure from Berlin, young Ralph Miller was enjoying a few runs at the Dartmouth Skiway with Nice. Both noticed the cold, windy weather, punctuated by harsh snow squalls that dumped an accumulation of new coverage. Found at the crash site were two pairs of handmade snowshoes hanging on saplings (above) and notes from the doctors (below, a closeup of Miller's last note). In retrospect, Ralph, Jr., sees his father's accident as an unfortunate series of relatively minor misjudgmentsnone of them serious individually, but, in succession, tragically fatal. Although the weather was threatening the night before the flight, Dr. Miller was a man who enjoyed calculated risks, and challenging weather was simply part of flying in northern New England. But he also believed in being prepared; a veteran of two flying expeditions in the Arctic, Miller owned a comprehensive winter survival kit that he often carried in his plane. Unfortunately, however, the kit had been removed from the airplane for a previous flight south and had never been replaced. Miller's son also remembers that the Comanche left Lebanon with less than full fuel tanks; again, this was not a serious oversight by itself, but it turned out that the plane couldn't be refueled in either Whitefield or Berlin. That meant there was just enoughbut none too muchfuel for the return flight. Finally, when the plane left Berlin for the return flight, Miller could have climbed up through the snow squalls, but he apparently felt more comfortable staying below the clouds so he could maintain visual contact with terrain that he recognized. As the ceiling lowered, however, that meant the option of returning to Berlin became impossible, since the narrow valley between Gorham and Jefferson was too tight for a turn. Low on fuel and probably blinded by the swirling snow, Miller dropped the Comanche's landing gear and applied full flaps to reduce its airspeed as he brought the airplane down in the midst of the Pemi. It will never be known exactly what downed them, but Miller's poise and experience clearly avoided a catastrophic impact with the ground. The fact that both doctors survived the crash with minimal injuries is a tribute to his ability to handle a plane under extreme conditions. The night before the ill-fated flight, Dr. Miller and his son had had a spirited conversation about the weather. Sadly, once the doctors were on the ground, the ironies continued to mount. The Comanche's radio had not been damaged in the crash, but the wrecked plane was surrounded by 4,000-foot ridges that effectively blocked any distant radio transmissions. Nevertheless, had the weather cooperated, Miller almost certainly would have been able to radio any planes flying overheadbut the winter storms that he'd bet his son were over kept search planes out of the skies until Wednesday, the day the doctors finally succumbed to the cold. A final tragic misjudgment, for which the doctors cannot be blamed, involves their decision to abort the effort to walk out from the crash site. After their ingenious attempt to fabricate snowshoes from the materials they had at hand, they followed the abandoned logging railroad bed more than a mile from the airplane. Given the severe cold and the deep snow, it is unlikely that they could have managed the 12-mile hike to the town of Lincoln, but less than a mile from the point where Dr. Miller's scalpel was found, a Forest Service cabin overlooks the logging trail. Although they had no way of knowing it, the two doctors were a mere eight-tenths of a mile from food and shelter that would have allowed them to survive well beyond Wednesday, when the air search began. Ralph Miller, Jr., acknowledges that his father thrived on taking calculated risks. Dr. Miller enjoyed reading accounts of the Arctic and Antarctic explorations of Peary, Shackleton, and Byrd. And because his chosen field within medicine brought him into contact with death almost daily, dying was for him not a terrifying philosophical concept but, instead, an inevitable part of living. His journal entries during the final four days suggest an objective, scientific detachment, rather than any sense of fear or desperation. His only stated regret was for his young colleague. The search was also full of tragic ironies. Phil Nice has reflected many times since 1959 on the unsuccessful, though not completely misguided, effort. "In my opinion," he says, "the largest mistake was a lack of a high-flying night search on the 22nd," during a break in the bad weather. After the plane was discovered, he adds, "we realized they did have a fire going that might have been seen." Nice says an experienced pilot based in Lebanon put in an urgent request to the military for a night search on the 22nd. But "the officer who was to be in charge of the flights did not arrive until afternoon because of engine trouble," explains Nice. In addition, although there was a massive mobilization of resources during the week following the doctors' disappearance, the operation lacked cohesion. "The search efforts were intense, but chaotic," says Nice, "due to too many units trying to be helpful, with no central organization to coordinate efforts." 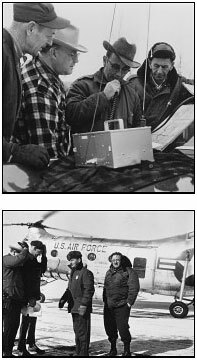 Although an extensive search (above) was mounted after the plane disappeared, the effort was hampered by communications that were rudimentary by today's standards (right) and by the fact that there was little coordination among all the individuals and organizations (including several branches of the military, below) that were involved. Nice also rues the fact that "there was a sense of pessimism on the part of some 'experts,' who were assuming that it would not be possible to survive a crash in the winter in New England. Those of us who knew Ralph Miller were more optimistic. . . . He was a knowledgeable outdoor person with good survival skills. The snowshoes he made the first night are evidence of that." But without a coordinated search effort, that confidence couldn't be reported and acted upon. Finally, so many well-intentioned but erroneous sightings were reported that Nice believes it seriously diluted the search effortstretching it far beyond the realistic location of the downed plane. Although the loss of Ralph Miller and Robert Quinn was a devastating blow to their families and a shock to the Dartmouth medical community, the last four decades have brought about changes that would have pleased the two men. The Rare Book Room at DMS's Dana Biomedical Library was named in Dr. Quinn's memory. And a Medical School lecture series was established in Dr. Miller's name. 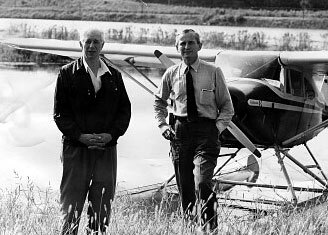 The Dartmouth Outing Club also paid tribute to the two men, by building the Miller-Quinn Airstrip in the College Grant to provide safe haven for other small planes that might be caught in similar circumstances over New Hampshire's north woods. And their deaths were not in vain. "The incident galvanized the community and began a tradition of wilderness search and rescue" that is today stronger than ever, according to current DMS student Timothy Burdick, who is the volunteer medical officer for the Upper Valley Wilderness Response Team. In addition, the doctors would no doubt be proud that both had a son who carried on their medical legacy. Ralph Miller, Jr., M.D., is an internist and endocrinologist at the University of Kentucky Medical Center, and Geoffrey Quinn, M.D., who was three years old when his father died, is a general internist in California. Dr. Miller especially would also be intrigued by advancements in search and rescue capabilities since 1959. Lieutenant David Hewitt, a New Hampshire conservation officer who played a central role in the effort to find the missing Learjet, says there have been many technological improvements over the past four decades. Dartmouth was instrumental in the search, at the individual (above) and organizational levels (below, with the Dartmouth Outing Club's John Rand at right). Following the disappearance of the Learjet from Lebanon's radar, the New Hampshire Department of Fish and Game, which has responsibility for organizing searches in the state, had immediate access to the Federal Aviation Agency's radar records and to taped transmissions of the aircraft's radio communications. The search for the Learjet was underway within an hour, using snowmobiles and allterrain vehicles. As the 1990s drew to a close, searchers also had access to high-tech instruments that enhanced the range of their eyes and ears. Computer-generated topographical maps and global positioning system devices allowed search teams looking for the Connecticut pilots to precisely identify what ground had been covered and where to look next. Cellular telephones and small, portable radios allowed search parties to easily stay in contact with each other and with the command center. Of the 14 helicopters provided by the military, some were equipped with infrared radar, capable of locating sources of heat on the ground, even at night. Military satellites were also pulled into the Learjet search, and intelligence analysts suggested sites that might have concealed the wreckage. Today there are also far more people in the woods, even in wintertime, than there were in 1959hiking, snowshoeing, cross-country skiing, and snowmobiling. Though still not densely populated, the northern part of the state is now crisscrossed by trails that didn't exist four decades ago. In addition, several teams of search dogs, capable of picking up the scent of a human from half a mile away, were pressed into service in the search for the downed Learjet. Perhaps two advancements would have held special significance for Dr. Miller. A technological marvel that would have made all the difference in 1959 is the Emergency Locator Transponder. This device is automatically activated in an emergency and emits a powerful radio signal that allows authorities to pinpoint the location of a downed aircraft within minutes. ELTs are currently required on all piston-driven aircraft (like Miller's Piper Comanche), though they are still optional on turbinepowered aircraft (like the Learjet). Had the ill-fated Learjet been equipped with an ELT, Civil Air Patrol officials theorize that the crash site would have been located within an hour. The second significant advancement has been organizational. Four decades after losing his mentor and friend in the 1959 crash, Phil Nice still voices frustration about the disorganization and fragmentation of the critical, preliminary search efforts. There were several state and federal agencies involved, as well as many volunteer organizations, but there was no clear operational leader. As a result, there was much duplication of effort. Today, letters of agreement exist among the various emergency response agencies, clearly defining an "incident command system," which assigns areas of responsibility, describes points of contact and cooperation among agencies, and even provides a common language to be used during an emergency. An observer at the command center of the search for the Learjet would have seen a much more organized and systematic interagency approach than Nice experienced in 1959. Mother Nature and the mountainous northern forests are every bit as unforgiving today as they were four decades ago. Yet all of these technological and organizational improvements were not what finally led searchers to the missing Learjet. It was a foresterengaged in a routine timber-stand evaluation, almost three years after the accident who finally came across the plane. It was located on a remote shoulder of Smarts Mountain in Lyme, N.H., about as far from a road as it's possible to get within the Upper Valley. The pilots, it was clear, had died on impact. 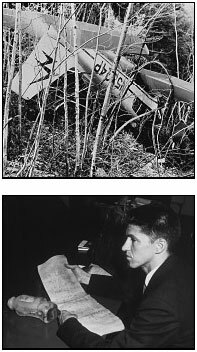 And the crash site had been completely camouflaged by treetops; even when the jet's exact location was pinpointed on aerial photos taken after the crash, no trace of the wreckage was visible. Lieutenant Hewitt pointed out in a press conference after the plane's discovery that 2,800 square milesthe presumed search area for the Learjetof predominantly forested wilderness is a huge expanse to cover methodically, whether on foot or by air. So although much has changed since Miller and Quinn wagered with the weather 41 years ago, much remains the same. Mother Nature and the mountainous northern forests are every bit as unforgiving today as they were four decades ago. John Morton was head coach of men's skiing at Dartmouth College from 1978 to 1989. He now designs trails for cross-country running and skiing and writes about the outdoors from his home in Thetford, Vt. He is also a six-time member as a competitor, coach, or team leader of the U.S. Olympic biathlon team. This is not the first time Morton has written about harrowing cold-weather exploits for Dartmouth Medicine; his "Drama on Denali" was the cover feature in the Winter 1999 issue. Among the sources Morton found especially helpful in researching this story was an article titled "The Missing Doctors" by Floyd W. Ramsey, published in the Winter 1986 issue of Magnetic North magazine.